The California Department of Corrections says a parolee-at-large has been captured after an officer-involved shooting in East Bakersfield. BAKERSFIELD, Calif. — The California Department of Corrections says a parolee-at-large has been captured after an officer-involved shooting in East Bakersfield. CDCR says officers from their Office of Correctional Safety (OCS) Fugitive Apprehension Team were working with a U.S. Marshals Task Force when suspect, identified as Gavino Castro fled. CDCR says there was an OIS, but none of their agents were directly involved. Castro was taken into custody. According to the Kern County Sheriff's Office, they were searching for the suspect at the Motel 6 and when he was located, that's when an OIS occurred. A deputy U.S. 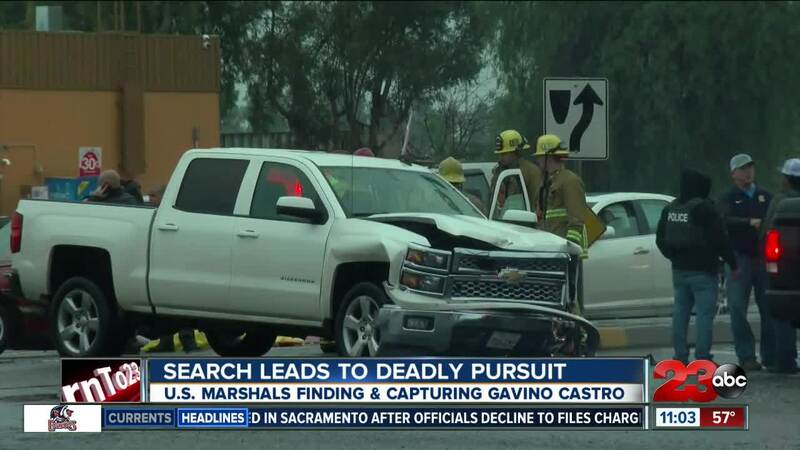 Marshal opened fire during the OIS. Following the shooting, the suspect fled in a car with two other people. Officers then followed the suspect towards Oswell and East Brundage where a two car crash occurred. An adult female was pronounced dead at the scene of the crash and a second person from the suspect vehicle took off from the car and ended up at Kern Medical for treatment before being taken into custody. KCSO said that it is unknown exactly where the injuries came from. The original suspect was taken into custody at the scene. All suspects have been taken into custody and there were no injuries to the driver of the car that was crashed into.